范坎, 郭安林, 康世磊, 赵东宏, 杨钟堂, 王虎, 刘养杰. 西秦岭舟曲峰迭和夏河桑日卡岩体锆石U-Pb年龄及其地质意义[J]. 地质通报, 2018, 37(5): 830-839. Fan K, Guo A L, Kang S L, Zhao D H, Yang Z T,Wang H, Liu Y J. Zircon U-Pb ages of Fengdie and Sangrika granitic plutons in West Qinling Orogen and their geological significance[J]. Geological Bulletin of China, 2018, 37(5): 830-839. Abstract: In this paper, the authors petrographically studied both Fengdie and Sanrika granitic plutons in Zhouqu County and Xiahe County of West Qinling Orogen and determined their zircon U-P ages. These two plutons which used to be recognized as Yanshanian (Middle-Late Mesozoic) intrusions yielded zircon U-Pb ages of 201.3±0.9Ma and 232.6±2.2Ma, respectively, suggesting that they should be products of the Indosinian (Early Mesozoic) magmatism and thus clarifying their timing in certain geological maps (1:250000). Combining previous age data with the authors' study, the authors argue that there is basically no Yanshanian granite exposed in West Qinling Orogen and the majority of granites of West Qinling Mountain are Indosinian in age and spatially distributed in the northern part of West Qinling Orogen. Therefore, West Qinling can be tectonically compared with South Qinling tectonic unit of East Qinling, and the former is the western extension of the latter. It can be seen from both the age and the geochemical data that Indosinian granites of West Qinling and South Qinling were derived from the similar sources and possessed characteristics of the basement of the Yangtz block. The reason for lacking Yanshanian granite in West Qinling can be attributed to obvious difference of the tectonic location between West Qinling and East Qinling, especially the Xiaoqinling where Yanshanian granites were well developed. The formation of Yanshanina granites in the Xiaoqinling was probably related to the destruction of the North China cratonic lithosphere or to the intracontinental subduction of the North China block. 张国伟, 张本仁, 袁学成, 等. 秦岭造山带与大陆动力学[M]. 北京: 科学出版社, 2001: 25-726. Zhang G W, Guo A L, Wang Y J, et al. Tectonics of South China Continent and its implications[J]. 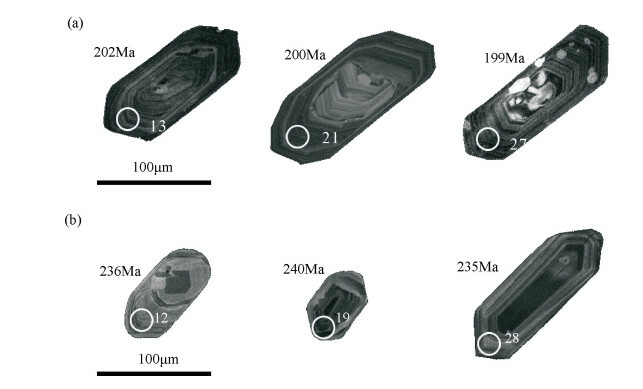 Science China Earth Sciences, 2013, 56(11): 1804–1828. DOI:10.1007/s11430-013-4679-1. 冯益民, 曹宣铎, 张二朋, 等. 秦岭造山带的演化、构造格局和性质[J]. 西北地质, 2003, 36(1): 1–10. 张旗, 殷先明, 殷勇, 等. 西秦岭与埃达克岩和喜马拉雅型花岗岩有关的金铜成矿及找矿问题[J]. 岩石学报, 2009, 25(12): 3103–3122. 张成立, 王涛, 王晓霞. 秦岭造山带早中生代花岗岩成因及其构造环境[J]. 高校地质学报, 2008, 14(3): 304–316. Wang X X, Wang T, Zhang C L. Neoproterozoic, Paleozoic, and Mesozoic granitoid magmatism in the QinlingOrogen, China:Constraints on orogenic process[J]. Journal of Asian Earth Sciences, 2013, 72(4): 129–151. 李永峰, 毛景文, 胡华斌, 等. 东秦岭钼矿类型、特征、成矿时代及其地球动力学背景[J]. 矿床地质, 2005, 24(3): 292–304. 胡受奚, 赵懿英, 徐金方. 华北地台金矿成矿地质[M]. 北京: 科学出版社, 1997: 1-220. 关保德. 河南华北地台南缘前寒武纪-早寒武世地质和成矿[M]. 武汉: 中国地质大学出版社, 1996: 1-325. Sun Y, Lu X X, Han S, et al. Composition and formation of Palaeozoic Erlangping ophiolitic slab, North Qinling:Evidence from geology and geochemistry[J]. Science in China (Ser.D), 1996(S1): 50–59. 游振东, 索书田. 造山带核部杂岩变质过程与构造解析-东秦岭为例[M]. 武汉: 中国地质大学出版社, 1991: 1-202. 王涛, 胡能高, 裴先治, 等. 秦岭造山带核部杂岩的组成、构造格局及演化[J]. 地球学报, 1997, 18(4): 345–351. 胡能高, 赵东林, 徐柏青, 等. 北秦岭含柯石英榴辉岩的发现及其意义[J]. 科学通报, 1994, 39(21): 2013. 杨经绥, 刘福来, 吴才来, 等. 中央碰撞造山带中两期超高压变质作用来自含柯石英锆石的U-Pb定年证据[J]. 地质学报, 2003, 77(4): 463–477. 陈丹玲, 刘良, 孙勇, 等. 北秦岭松树沟高压基性麻粒岩锆石的LA-ICP-MS U-Pb定年及其地质意义[J]. 科学通报, 2004, 49(18): 1901–1908. DOI:10.3321/j.issn:0023-074X.2004.18.014. 刘良, 周鼎武, 王焰, 等. 东秦岭秦岭杂岩中的长英质高压麻粒岩及其地质意义初探[J]. 中国科学(D辑), 1996, 26(增刊): 56–63. 李婷, 徐学义, 陈隽璐, 等. 西秦岭造山带礼县地区中川岩体LAICP-MS锆石U-Pb定年及其构造环境[J]. 地质通报, 2012, 31(6): 875–883. 张国伟, 郭安林, 姚安平. 中国大陆构造中的西秦岭-松潘大陆构造结[J]. 地质前缘, 2004, 11(3): 23–32. 韦萍, 莫宣学, 喻学惠, 等. 西秦岭夏河花岗岩的地球化学、年代学及地质意义[J]. 岩石学报, 2013, 29(11): 3981–3992. 靳晓野, 李建威, 隋吉祥, 等. 西秦岭夏河-合作地区德乌鲁杂岩体的侵位时代、岩石成因及构造意义[J]. 地球科学与环境学报, 2013, 35(3): 20–38. 张宏飞, 靳兰兰, 张利, 等. 西秦岭花岗岩类地球化学和Pb-SrNd同位素组成对基底性质及其构造属性的限制[J]. 中国科学(D辑), 2005, 35(10): 914–926. 骆必继, 张宏飞, 肖尊奇. 西秦岭印支早期美武岩体的岩石成因及其构造意义[J]. 地学前缘, 2012, 19(3): 199–213. 金维浚, 张旗, 何登发, 等. 西秦岭埃达克岩的SHRIMP定年及其构造意义[J]. 岩石学报, 2005, 21(3): 959–966. 殷勇, 殷先明. 西秦岭北缘与埃达克岩和喜马拉雅型花岗岩有关的斑岩型铜-钼-金成矿作用[J]. 岩石学报, 2009, 25(5): 1239–1252. Qin J F, Lai S C, Grapes R, et al. Geochemical evidence for origin of magma mixing for the Triassic monzonitic granite and its enclaves at Mishuling in the Qinling orogen (central China)[J]. Lithos, 2009, 112(3/4): 259–276. Dong Y P, Zhang G W, Franz N, et al. Tectonic evolution of the Qinling orogen, China:Review and synthesis[J]. 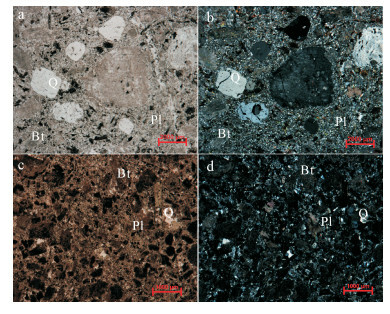 Journal of Asian Earth Sciences, 2011, 41(3): 213–237. DOI:10.1016/j.jseaes.2011.03.002. Andersen T. Correction of common lead in U-Pb analyses that do not report 204Pb[J]. Chem. Geol., 2002, 192(1/2): 59–79. Ludwig K R. Isoplot 3.0-A geochronological toolkit for microsoft excel[M]. Berkeley Geochronology Center, 2003: 1-70. Yuan H L, Gao S, Liu X M, et al. Accurate U-Pb age and trace element determinations of zircon by laser ablation inductively coupled plasma mass spectrometry[J]. Geostan Geoanal Res., 2004, 28(3): 353–370. DOI:10.1111/ggr.2004.28.issue-3. 吴元保, 郑永飞. 锆石成因矿物学研究及其对U-Pb年龄解释的制约[J]. 科学通报, 2004, 49(16): 181–189. Belousova E A, Griffin W L, O'Reilly S Y, et al. Igneous zircon:Trace element composition as an indicalor of source rock type[J]. Contributions to Mineralogy and Petrology, 2002, 143(5): 602–622. DOI:10.1007/s00410-002-0364-7. Siebel W, Blaha U, Chen F K, et al. Geocheronology and geochemistry of a dyke-host rock association and implications for the formation of the Bavarian Pfahl shear zone, Bohemian Massif[J]. International Journal of Earth Sciences, 2005, 94(1): 8–23. DOI:10.1007/s00531-004-0445-0. Hoskin P W O. Rare earth element chemistry of zircon and its use as a provenance indicator[J]. Geology, 2002, 28(7): 627–630. 徐学义, 李婷, 陈隽璐, 等. 西秦岭西段花岗岩浆作用与成矿[J]. 西北地质, 2012, 45(4): 76–82. 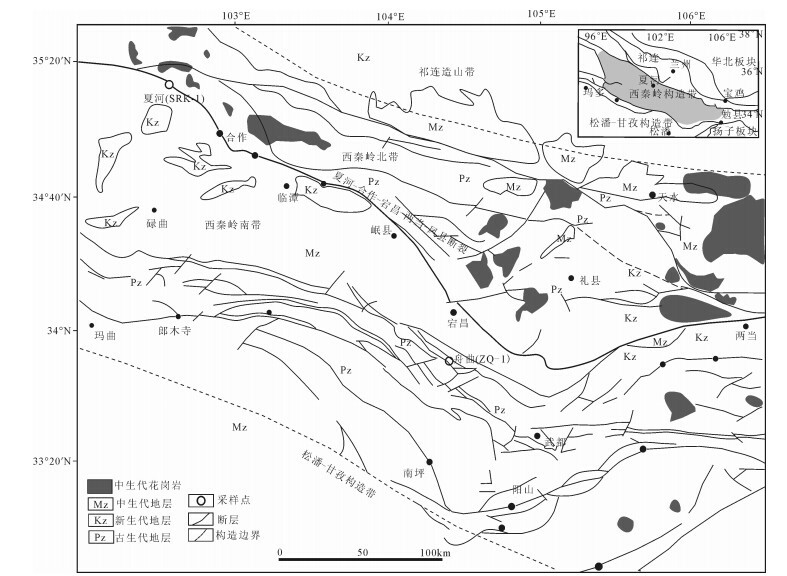 Wu Y B, Zheng Y F. Tectonic evolution of a composite collision orogen:an overview on the Qinling-Tongbai-Hong'an-DabieSulu orogenic belt in central China[J]. Gondwana Research, 2013, 23(4): 1402–1428. DOI:10.1016/j.gr.2012.09.007. 李立, 杨辟元, 段波, 等. 东秦岭岩石层的地电模型[J]. 地球物理学报, 1998, 41(2): 189–195. 高锐, 马永生, 朱铉, 等. 松潘地块北缘岩石圈结构及其与东昆仑-西秦岭造山带关系[C]//中国地质学会、国土资源部地质勘查司". 十五"重要地质科技成果暨重大找矿成果交流会材料四——"十五"地质行业重要地质科技成果资料汇编. 2006. 张宏仁. 燕山事件[J]. 地质学报, 1998, 78(2): 103–111. 张宏仁, 张永康, 蔡向民, 等. 燕山运动的"绪动" -燕山事件[J]. 地质学报, 2013, 87(12): 1779–1790. Zheng J P, Griffin W L, Sun M, et al. Tectonic affinity of the West Qinling orogen (central China):North China or Yangtze?[J]. Tectonics, 2010, 29(2): 1–14. ① 甘肃省地质调查院. 甘肃省1: 25万武都县幅建造构造图. 2010. ② 甘肃省地质调查院. 甘肃省1: 25万临夏市幅建造构造图. 2010.